It has been a busy weekend around the homestead, with the bulk of that time spent building the northern run extension for the chickens. Check back tomorrow for pics and details on that. It seems that every weekend I have more on my to-do list than there is hours in the day, and this weekend was that way and then some! On Saturday I intended on finishing the run extension, then working on winter sowing (am I ever going to get to this!? 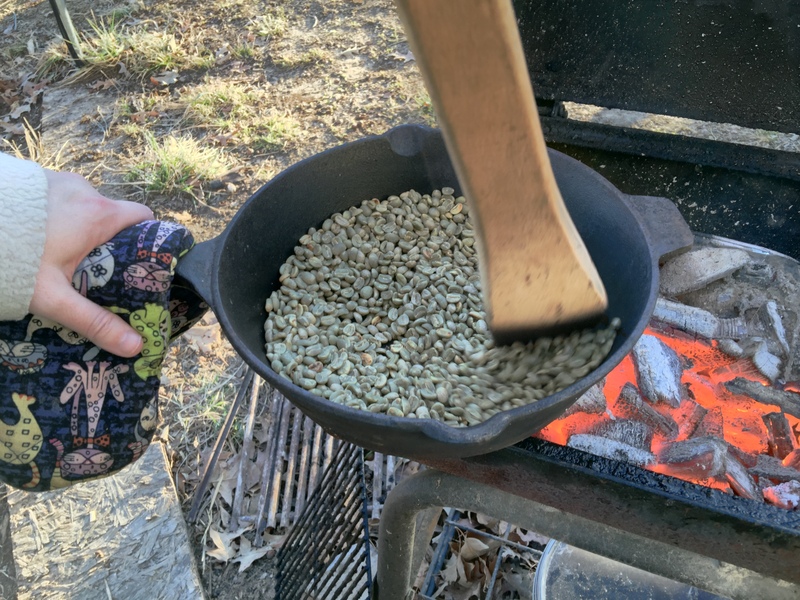 ), roasting coffee, and the normal weekend chores. I only finished the run extension and roasted coffee though. No, that is not me stirring the coffee. My lovely wife agreed to hold the pan and stir while I snapped a picture. This week I roasted mostly Brazilian coffee, but this batch happened to be a new one for me: Peruvian. I just finished a cup as I am writing this, and it is a definite keeper. I tend to enjoy the South American coffees best, and in my opinion this Peruvian coffee had that same flavor I enjoy. Do you realize it is just three months until May? That means it is just three months until my garden will be fully planted, I hope! I know it seems so far out, but it won’t be long until the cooler weather crops are growing. That reminds me – I need to be getting some peas sown! Argh! Maybe next weekend! 😀 No boredom, that is for sure! This entry was posted in Gardening, Hobbies, Pictures and tagged in coffee, Peruvian Coffee, Planting Schedule.